A new sport, straight out of children&apos;s literature, is sweeping college campuses across the country and has landed in the Rockford region. Quidditch, created by J.K. Rowling for the Harry Potter children&apos;s series, has traversed from fiction to reality and will hit the fields in Rockford. The Rockford region will host its first-ever Quidditch tournament, the International Quidditch Association&apos;s Midwest Regionals, April 26-27, 2013 on fields adjacent to Elliot Golf Course. The sport now boasts more than 1,000 teams and is played on six different continents. The tournament held in Rockford will include up to 16 co-ed teams from colleges and universities throughout the Midwest. Some modifications have been made to accommodate the players&apos; lack of magical abilities. For example brooms remain grounded and the yellow snitch has traded its wings for legs. "What really appealed to me about hosting a tournament here in Rockford, was the possibility for future quidditch growth in the area. 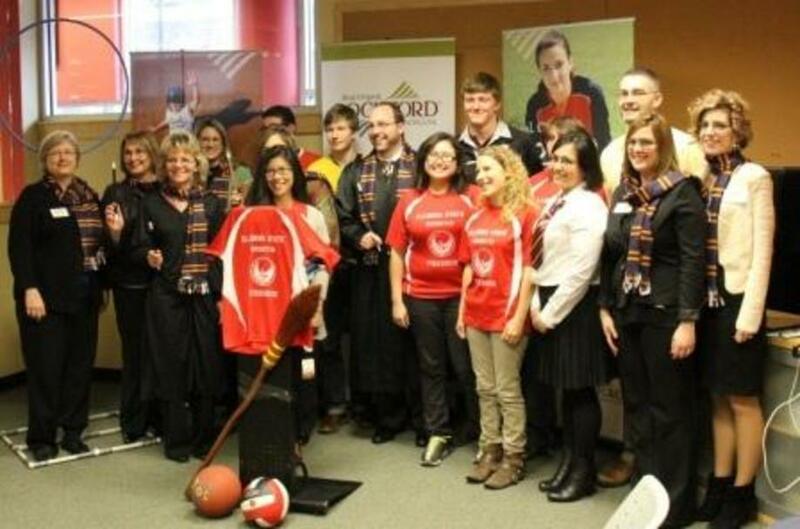 Rockford has some great facilities like Sportscore One and Two, and they would be potentially perfect locations to host a larger scale tournament in the future such as the Midwest Regionals or World Cup for quidditch," said Shayla Johnson, the Illinois State Qidditch Representative. The event will fill 200 hotel room nights and generate an estimated $36,000 for area businesses.